Mine is a classic reusable string from ECOBAGS. It’s supremely light and portable, and the way it expands makes it a great teaching tool (cashiers are amazed!). 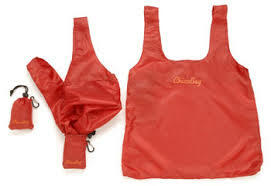 Made of colorful lightweight polyester, my reusable ChicoBag scrunches up nicely inside its own pouch. Mine was a premium for donating to Grist.org. These reusable, washable drawstring bags from Earthwise help me cut down on plastic bags to hold fresh produce purchased at the supermarket. The barcodes are clearly visible at checkout. 4. 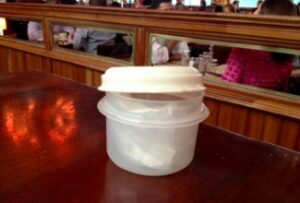 Personal “doggie bag” for restaurants. I don’t always remember to bring this, but I created a makeshift doggie bag kit by filling a small plastic Tupperware-type food container with a couple of plastic baggies and twist ties. When we eat out, I can easily bag up the uneaten bread from the basket and plop a small amount of food in this reusable container. Inspired by the WeHateToWaste story on picking up litter, I try to carry at least one plastic bag in my purse or pocket for picking up stray objects on the street. I use the newspaper delivery bag like an evening glove (very elegant!) to pick up any offending item in my path. Of course, I carry my official WeHateToWaste People Towel for quick hand drying. 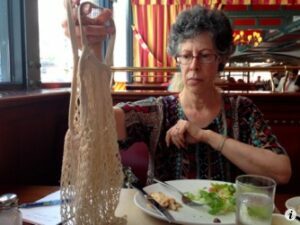 If given extra napkins at a restaurant, I put one or two in my purse so I can use them for the odd clean-up task as well. As readers of my “Disposable Pen Peeve” post know, I am trying to reduce pen proliferation, especially the disposable kind. 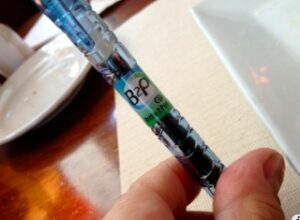 I now carry one Pilot “B to P” (Bottles to Plastic) pen, and I have a packet of refills at home. What Inspires Me To Carry My Waste-Preventing Reusables? At the end of our lunch conversation, Jacquie asked me why I do all of this. I reached into my purse and pulled out one more item —the photo of my daughter that I carry in my wallet. Trying to live sustainably is simply the right thing to do, an “Intergenerational Golden Rule” that inspires me to use resources wisely. In the process I hope to set a good example for her and for my students. I carry the future with me. I do it for them. So What’s In Your Purse Or Bag? In the course of writing this, I discovered that there is actually a party game called “What’s in your purse?” I can’t promise you any points or prizes, but I’m sure Jacquie and others would love to hear what reusables you carry in your purse, pocket, satchel, briefcase, or book bag to make the world a little bit greener, a little bit less wasteful. What reusables do you carry in your bag? My purse doesn’t look too different to this! I didn’t actually realise how many reusable I carried around with me until I emptied them out – I’ve got a people towel, keep cup, shopping bag and steel water bottle! And my handbag isn’t even that big, and I still have plenty of room in there for an umbrella, book, wallet and various other typical female handbag items! It’s just become normal for me to carry all these with me now, not a hassle at all. To the extent that I now get genuinely agitated if I leave one of them behind. The most inconvenient item in there is my 800ml steel water bottle – its heavy, clunky and big! But it’s the one thing I don’t leave home without, disposable water bottles are my number one peeve! I’m with you, Beth. Carrying around my ChicoBag, PeopleTowel, spork and a couple of cardboard coffee sleeves has become second nature. None of them are heavy and I guess I have a little extra room in my bag since I don’t carry around cosmetics or a wallet or even a hairbrush. Gotta remember to drop in a couple of Ziplocs like Fredrica – great idea! As a male who used to eat out a lot I quickly noticed how plastic water bottles get thrusted at you from all angles. In my bag I always carry my stainless steel water bottle, re-useable coffee cup and bio degradable shopping bag. A few items that take up no space, add next to no weight but can make a huge difference on our environment. I agree with you on the water bottle, while it can be large and clunky I quickly adjusted to the stage where I can’t leave home without it! You have inspired me to ALWAYS bring an empty to-go container with me. My habit is sporadic and I hate being a hypocritical waste hater at the end of the evening. For eating the offending item (if I forget my container), at least I have my 2-year old son’s cutlery with me when we’re out. So I can borrow a tiny fork or spoon from him. The water bottle I’m religious about. I simply fill it with tap water wherever I am. Sometimes the water is less than wonderful (Florida) but sometimes the water is incredibly crisp, cool and refreshing (Maine). It’s hard to convince some people that reusable water canteens are actually the easier option when we’ve all been plastic bottle brainwashed. Whenever a clerk even sets a hand on a plastic bag for packaging an item, I quickly affirm NO PLASTIC PLEASE! I would just assume carry 20 things out of a store in my arms than accept a plastic bag (that is, if I forget to bring my cloth shopping bag). Thank you for including our Reusable Mesh Produce Sacks in your post. 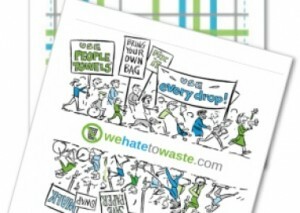 At Earthwise, we hate to waste too. In case your readers wanted to buy the sacks, they are available on Amazon: http://www.amazon.com/Earthwise-EW105-Reusable-Produce-Sacks/dp/B005E2QRPG/ref=sr_1_1?m=A6XTBI41XN268&s=merchant-items&ie=UTF8&qid=1415046690&sr=1-1. 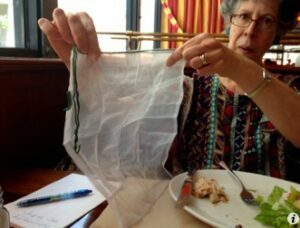 A gallon size zip-lock bag for compostables (my own or those of my dining companions) is my number one waist reducing purse item. I use it not only for leftovers that aren’t food-worthy, but also for things as small as the rind of lemon peel off of a water glass. I even put paper napkins (when I use them at all) in my compost bag so that at least they don’t end up in a landfill. After transferring the contents to my compost pile I of course rinse the bag and put it back in my purse to reuse. The other somewhat unusual reusable I carry is a drinking straw, so that if I’m ordering a drink that I want a straw for I can say “no straw please” since I know they are a major culprit for ending up in oceans. I now have a lovely bamboo straw which a friend made for me, but prior to that I just carried and reused a regular disposable plastic straw. What a great post! I think circulating something like this would really encourage people to be more conscious about carrying along simple items that can make a huge difference. I too had never really thought about what reusable things I carry in my purse until reading this post, and it turns out its more than I thought! The one thing that I almost always carry with me that happened to be on the list is my Chico Bag! I have three of them and they’re great, I recommend them to everyone. I keep them in my purse and use them for groceries and even impromptu (or not-so-impromptu) shopping trips. This way when they offer me a bag I can kindly decline. Chico Bags are extremely light-weight and can fold up to be so small they barely take up any space. Not to mention, they come in tons of great colors and designs! Similar to some of the posts above I also use a reusable coffee cup AND a reusable water bottle every day. They do tend to be really bulky and take up a ton of space in my purse. I also get nervous that if there is anything left in my coffee cup it might leak out into my purse, which we all know could be potentially disastrous. So, to solve these problems I went on a hunt for solutions. In my search for a more compact water bottle, I found that the Camel Back Chute is a lot thinner than my old Nalgene bottle making more room in my purse, and it also happens to be a lot less spill-proof. Also, for the coffee cup, after looking around I found the perfect mug at Starbucks. They just produced a new mug that has a buckle on the side of the handle that connects to the mug itself, so now I can clip it to the handle of my purse. It might not be as aesthetically pleasing as hiding it inside my purse, but even with a large purse, who can fit a water bottle AND a coffee mug inside? These items come with me every day, and after reading this list I intend to incorporate many more reusables into my purse! Thanks for the list! I’m surprised no one has yet mentioned a To-Go Ware utensil set, so I will! I love my bamboo fork, knife & spoon and chopsticks too, and use them to avoid taking disposable plastics wherever I go. In addition to preventing waste, they’re also functionally better than disposables–strong enough to get a good stab into a hearty salad! Get yours at http://www.to-goware.com. I also have several Chico bags (the BEST; all others, especially the thick plastic reusable bags that rip after 1-2 uses are negative-sustainable), a reusable metal drinking straw and a collapsible silicone drinking cup that I got at REI (camping gear). I keep my reusable water bottles in my cars, or if I’m walking/hiking, I’ll take my refillable Camelbak. Looks like I need to add a People Towel and maybe the Ziploc for compostables and I’ll be well-equipped in my pursuit of zero waste living! (I have a pocket in my briefcase where I sometimes put a banana peel or apple core to carry home to the composter, but a designated bag would be an improvement.) THANK YOU everyone who responded–now how do we get everyone else to follow suit? When I first moved to the city (and finally got rid of my car!) my pocketbook turned into my car. It wasn’t until I took all of the important things out of my car and tried to fit them in my bag that I realized all of the reusable things I was carrying around with me. I always have my Nalgene water bottle and Contigo coffee cup with me. The Contigo has an auto lock so I never have to worry about spills. I always have a reusable bag with me too. This has probably been the most useful item I carry with me in the city because I am always picking up groceries for dinner on my way home. I tried to bring my lunch to work everyday so there is usually a reusable food container and utensils in there too. I am glad I read this article and all the comments, there are a few things missing from my bag that I will definitely be looking into, like the People Towel and a To-Go Ware set! Thanks to everyone who shared their comments. I wanted to give you an update, since I have added some reusables to my story. First…I remember sending my father to work in the 50s and 60s with a clean and pressed white handkerchief. Now I keep one (clean, but not pressed) in my purse to replace disposable tissues. Wish I could find some pretty handkerchiefs, like the ones my mother used in those days. Second item is a “winter cold kit.” I could never bear to throw away Altoids tins, so I have quite a few saved up. I decided to fill one with a strip of decongestant/antihistamine tablets and some wrapped lozenges. Perhaps you can think of other “kits” that could be created this way. My third “new” reusable is my purse itself! The lining of my favorite handbag, which I had repaired several times with needle and thread over the years, finally gave way. I had purchased it at a craft fair, so I tracked down the artisan and asked if she could re-line it for me. 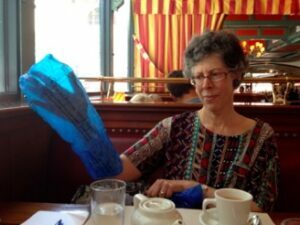 For much less than the cost of a new purse, Carol re-lined it with rip-stop nylon, complete with zippered compartments, and mailed it back to me. Thanks to her, my one-of-a-kind bag is good as new and back in service! 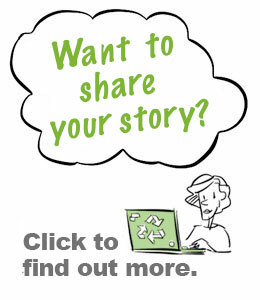 I am now doing workshops for groups on facilitating creative ideas for reducing and reusing. This comment of yours has given me a great new challenge to pose to the next groups: How can we bring back handkerchiefs? They still make so much sense to me! Hard to see all the tissues that pile up when one is sick. Read in the paper recently where our Mayor DeBlasio was sick and created quite the pile of tissues in the process. 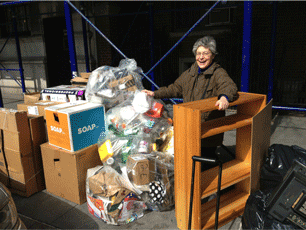 I felt like writing a letter to him letting him know that the trash bill — and pile— in NYC is quite high enough! I consider myself to be someone who is conscious of reducing waste but I now know that there are many reusable items that I am lacking in my purse. I can’t wait to use these ideas in my own life and encourage my peers to do the same. I recently read the WHTW post about the “Kill The Cup” campaign, and this post makes me think that a “What’s in Your Purse” social media campaign could be very exciting. While that particular name may make it a bit gender specific, it would be so interesting to see what innovative reusables individuals are carrying with them on a daily basis. We should take pride in our use of these items and inspire others to do the same! I carry a medium-sized purse that’s large enough to fit my refillable water bottle with the mascot of the university I got both of my degrees from. It’s really convenient to have when I’m thirsty and it has a nice sport cap. I also use those B to P pens. I keep 3 of those pens in my purse at a time. It’s so much cheaper to own refillable pens and it makes me feel better to have one more thing I can reuse continuously. The third thing I have is a glasses cleaning cloth that I’ve used a couple times as a mini hand towel. I have a few of them that I’ve acquired over the years. I love using it for more than just cleaning glasses. Wow, I never would have thought about bringing my doggie bag when I go to a restaurant. That is a really neat idea that I might just have to make a habit out of. Another thing that I never really thought about doing is carrying a reusable cloth around to dry your hands off. In my hand bag, I try to always make sure I have at least one reusable bag, my water bottle, and coffee mug. I personally don’t really like carrying around large handbags so fitting all of these items might be a little tricky. This is an article that hits home to me. It serves as both a reminder of things that I need to be better at doing as well as an affirmation that there are some practices that I am currently doing well. My school backpack functions as a reusable bag if I am even in need and on the go and contained within that I try to keep a couple plastic baggies for leftover food at events that might otherwise go to waste. I also keep a hard plastic container for some snacks in lieu of using a single-use plastic baggy. I like to think of the mesh slots on either side of my bag as holsters that contain the most important reusable containers in my arsenal – my water bottle and my coffee mug. I made a rule for myself that I wouldn’t let myself buy hot coffee unless I had my mug with me, and so it’s with me all the time! Neither of these containers works well for iced coffee so that is an issue I’ve yet to address because I am still guilty of treating myself to an iced coffee once in awhile. I generally try to live a green lifestyle, but this article really brought to life what more I could be doing as far as on the go waste prevention. 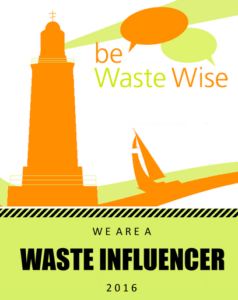 Each item mentioned takes up relatively little space and can end up making a big difference in reducing personal waste. I know at times I can be such a minimalist and rarely carry more than a small bag on most days, but I could definitely see myself grabbing a bigger bag while shopping to be able to put in some of the suggested items. In addition to the suggestions mentioned, one thing that I always do while clothing shopping is to ask if the retailer has reusable cloth bags. A lot of boutiques and clothing stores provide alternatives to paper or plastic bags that can be used over and over again and even can make a fashion statement. This is a great alternative if you forget to bring your own bag along!